Since 1987, Palm Technology has supplied the Metal Finishing Industry with quality tanks, instrumentation and related services. 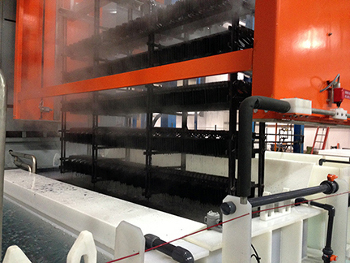 Palm is a leader in the engineering, fabrication and installation of automatic and manual Anodizing Lines. We use the highest quality materials and the latest technology to supply Anodizing Lines built to provide long term service in an industrial environment. Anodizing is an electrochemical process to oxidize the metal surface increasing hardness, corrosion and wear resistance. Palm builds Anodizing Lines for aerospace, automotive, defense and industrial applications. 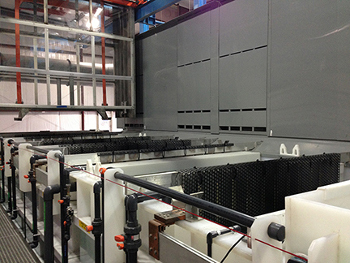 Palm Technology can supply a complete automatic Anodizing Line or upgrade an existing line. Palm's modular design minimizes installation time, provides the customer with process flexibility and allows for the line to be easily expanded. We listen to our customers and will work with you to develop a solution that will provide you with the reliability and capabilities to meet your current and future requirements.